We woke up early and saw the sun rise the first time. We taped a cardboard box shut, and cut-out a large hole so the box could be placed over our heads. A pin prick in the opposite corner was all that was needed for the sun to pass through. We got in the truck and drove to the harbour where the tide was nearly all the way out. We were not sure what we would see, or what we might feel. As the solar eclipse began, we started and stopped a number of performed actions. Every fifteen minutes we would be interrupted by the urge to look in our DIY pinhole camera and see how much the positions of the sun and the moon had changed. The light around us was altered with an almost metallic hue, and we witnessed the shadows being cast with uncertainty. For a moment, it got colder, as the moon began to cover ninety percent of the sun. Hardly a cloud was in the sky. The chilly air of dusk swept through the harbour in the middle of a balmy morning. Salt Spring Island was not on the path of totality, but very nearby to Victoria, BC which was identified as the best city to view the eclipse within Canada. The three-ferry sailing wait to get to Victoria at the start of the eclipse weekend was possibly a result of this small migration of enthusiasts. A nearly ideal spot to view the celestial phenomena, Salt Spring also presented an opportunity to think about the relationship between the island and the mainland, between central and peripheral places of being. If a cosmic shift in positions was possible, could we be encouraged to think about these earthbound geographies in more flexible terms? The diverse landscapes of the Island had a major influence on the development of the artwork for Inside the Day was Night. The environmental conditions guided much of our behaviour and actions throughout the project. We waited patiently for tides to either recede or approach. We had to hold tightly to sculptures as the wind transformed them into sails. We followed shadows as they stretched and contracted. We let currents float artworks away from us, and then swam out, or clambered over jagged rocks to retrieve them. While our own movements involved passing, crossing, handing, and following, the forces of the landscape contributed movements of submerging, covering, shifting, and engulfing. We placed our bodies in, or out, of alignment with the world around us. Inside the Day was Night. 2017. Work in progress. Experimenting with materials on the surface of the water. The artwork emerged out of a process-based approach. Working with many variables and changing conditions, the work was more about anticipating and responding. It was not clear how certain materials would react in the landscapes, how certain positions would appear at a distance, or how layering would alter objects, bodies and spaces. A quality of unknowingness is present throughout all of the artworks, but taken together, they express a certain composite experience about the landscape and our positions within it. Inside the Day was Night. 2017. Work in progress. An early test of some movements with the sculptures through through the landscape. Artist Andrew Maize arrived in Prince George on a passenger train three days before the close of Disturbances in the Field. Having spent the majority of the exhibition rolling through the vast expanse of the Canadian landscape, the travel formed an integral part of Maize’s process-based artwork. The artist followed the contours of a rail-line once used to cinch the settler-state’s fledgling sense of national identity together in the nineteenth and early twentieth-centuries. A tool to “unite”, “connect”, and “join” the economic and social resources of the country together, the early railway portrayed a veneer of harmony and accord that glossed over the brutal machinations of colonization. In Prince George specifically, the history of the Grand Trunk Pacific Railway (GTP) has strikingly direct connections to resource extraction (forestry), the rivers that traverse the city, and the displacement of the Lheidli T’enneh First Nation. Capital-driven power and imperialism coalesced in harrowing ways between 1907 and 1913, which ultimately saw the GTP's controversial acquisition of reserve land, and the forcible relocation of the Lheidli T’enneh. The existing village was set on fire and razed to the ground to make way for the passage of the railway . This land continues to be a part of the specific claims resolution process in the Lheidli T’enneh’s fight for treaty rights, where the council notes, “the surrender of land at Fort George IR#1 remains an injustice that more than 100 years later still requires resolution” . Today, this space is now a public park. In 2015, Fort George Park, the former site of IR#1, was renamed Lheidli T’enneh Memorial Park in a city council vote . Railway Museum, Prince George. 2017. Photo by Denis Gutiérrez-Ogrinc. 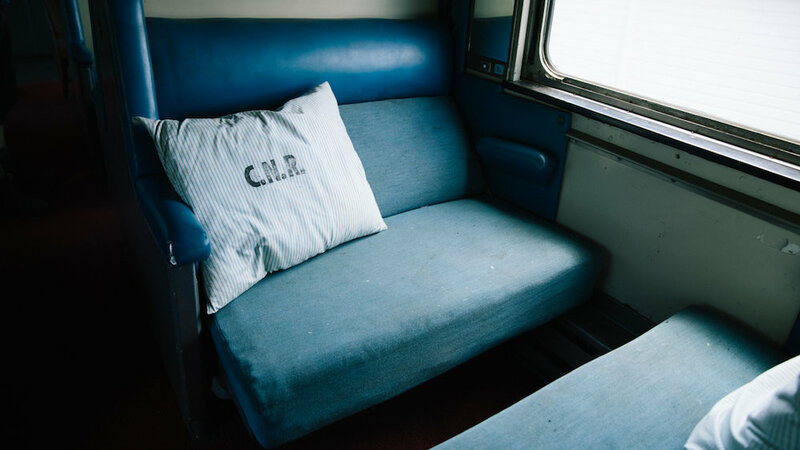 Maize’s overarching research project nations are narrations, titled after a line by Edward Said, is looking at the ways in which confederate-driven enterprises like the railway have shaped, displaced, and profited communities in disproportionate ways. Maize’s time spent travelling by train allowed the artist to listen closely to the spectrum of narratives that are told about these places and their histories. Maize became particularly attentive to the contentiousness of place-naming. Influenced by Lucy Lippard’s claim that “every place name is a story, an outcropping of the shared tales that form the bedrock of community” , Maize wondered about the sociopolitical motivations behind re-naming a place, and the instabilities of place and community that accompany such alterations in the ‘bedrock’. Over the course of two days, Maize conceptualized a sculpture-based performance piece titled FRASER (confluence). The work makes use of the name Simon Fraser, a figure whose presence in the region continues to be channeled through the river named after him. On the first day, Maize sourced two planks of freshly hewed Douglas Fir from a local mill on the outskirts of town. For the artist, these long, rectilinear shapes echo the slats of wooden ties that form rail tracks, and are also the familiar materials seen in the cargo loads of freights travelling through Northern British Columbia. In the evening, Maize began a smoking process that charred the lumber, priming the raw material in preparation for carving. Secured together so the smoke could be funnelled through a small gap between the wood, the blackened pair of boards resembled something similar to a Rorschach blot test when separated. As a result, the two planks bore completely identical, but inverted markings. The mirrored qualities created an effect that bound the pieces visually together as a paralleled set. Andrew Maize. FRASER (confluence). 2017. Detail of work in progress. Carrying plank to be launched into the confluence. Photo by Denis Gutiérrez-Ogrinc. Andrew Maize. FRASER (confluence). 2017. Photo by Caitlin Chaisson. Andrew Maize. FRASER (confluence). 2017. Detail of work in progress. Photo by Denis Gutiérrez-Ogrinc. Andrew Maize. FRASER (confluence). 2017. Detail of carving. Photo by Denis Gutiérrez-Ogrinc. Inversion, repetition and distortion became the major process strategies for the artist, who continued to work on FRASER (confluence) the following day on a bank of the Nechako River in Cottonwood Island Park. For about five hours, Maize used a chisel to carve text into the charcoal surface, interacting with local passersbys as he worked. On one plank, the name “Fraser” appears in a vertical scroll. Without margins between the lines, the repeated and conjoined F’s deliberately spell Eraser. On the other plank, Maize carved out the negative space around the text, raising the name Fraser in a lettering shaped out of the blistered charcoal. When the chiselling was complete, the pair was split up by the artist. One of the planks was taken into town and the other was tossed into the confluence of the rivers, where it was carried by swift currents and will ultimately be left to deteriorate when it gets caught in the tangles along the water’s edge. Much like the artist’s sojourn, FRASER (confluence) involved a kind of tracing and retracing of ideas and movements through space. As an experimental artwork informed by the artist's rail-travel, the history of the city of Prince George, and the colonial legacies of naming, FRASER (confluence) is an expansive work that draws on many influences. The legibility of the text on the planks will not weather well. The material is brittle, and already showing signs of breaking down. Maize would like to thank Arts Nova Scotia for their support in his project nations are narrations. Vogt, David and David Alexander Gamble. ‘“You Don’t Suppose the Dominion Government Wants to Cheat the Indians?”: The Grand Trunk Pacific Railway and the Fort George Reserve, 1908-12’. BC Studies, 166: Summer 2010. <http://ojs.library.ubc.ca/index.php/bcstudies/article/viewFile/288/1872>. Lheidli T’enneh Historical Timeline. <http://www.pgdta.ca/uploads/2/4/1/7/24178565/lheidli_tenneh_historical_timeline_2014v.pdf>. Daybreak North. “Lheidli T’enneh Memorial Park to be new name of Prince George Park.” CBC News. June 17,2015. <http://www.cbc.ca/news/canada/british-columbia/lheidli-t-enneh-memorial-park-to-be-new-name-of-prince-george-park-1.3116122>. Lippard, Lucy. Lure of the Local: Senses of Place in a Multicentered Society. New York: The New Press, 1997. Reflections, interviews, questions and responses. "Some People Plough Their Fields"